Return flights to Mexico City from Brussels €396, Switzerland €473! Fly to Hawaii from Italy for €459, Amsterdam €472 or the UK £438 return! Multi-city flights from London to China & tropical Phu Quoc (Vietnam) £355! Another good option with Air France / KLM between Europe and Mexico City these days this time fairly priced return flights from Brussels already for €396 or Switzerland (Geneva, Zurich) from €473. Fare is including all taxes and 23kg checked bag. Note that our solution from Belgium is based on railway service between Brussels and Paris or Amsterdam. Remember that even in this case you can not skip first leg of your outbound flight. If interested in this Air France / KLM promotion you will find the cheapest flights between November 2017 and April 2018. Blackout period around Christmas holidays. For a bit higher fare but still competitive price you can also fly in May, June or September to October. Discount with Air France and KLM is applicable to bookings made till 25th of May or until sold out. Max stay 3months. If you are interested in deals with Air France / KLM you should also consider our yesterday´s post from Belgium to North America (San Francisco, Houston, Denver). Check out the details here. If you would need an accommodation in Mexico City you may use Booking.com or consider following promo codes offered by Amoma, Hotelopia or Venere. Flights are available next whole winter season 2017/2018 which is considered as peak season and best time to travel this destination. 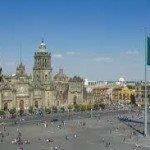 Booking sample of cheap return flights to Mexico City from Brussels €396, Switzerland €473! In this case you would depart from Belgium to Mexico on 21st of January 2018. Remember that first leg is based on train service. You would be returning from North America to Europe two weeks later, on Sunday, 4th of February 2018.